For many, breaking into mountain bike racing can be a daunting proposition. Often times athletes struggle with how to choose the appropriate race, how to properly alter their training plan, and what to do in order to arrive prepared on race day. Racing off-road is an excellent compliment to your training on the road and can add up to huge gains in your overall fitness and confidence on the bike. By implementing mountain bike specific training and adding a few events to your calendar you’ll have a productive and exciting race season. It can be challenging for athletes new to the sport to know what kind of event to participate in. There are any number of different disciplines, all of which require alterations to your training regimen to ensure you’re preparing properly for the specific type of racing. For most athletes, I like to recommend starting with cross-country (XC) racing. These races are typically shorter in length and duration than more endurance based races and offer a great snapshot of everything mountain bike racing has to offer. XC races require you to draw on a number of skills including endurance, speed, and bike handling. Competing in these events is the perfect way to mix up your regularly scheduled season. If the first few cross-country races go well, you could then prepare for a 50-mile mountian bike race. While many of the same training principles apply in both road and mountain bike racing, it’s important to apply specific types of training to prepare for the type of riding and racing you’re doing. When racing off-road, I like to recommend honing in on the following four areas to insure both confidence and success when race day comes. Once you’ve decided on the race you’re going to do, you’ll want to begin training with specific elements of that race in mind. Is the terrain going to be overly technical? Will there be a lot of climbing? Is it a short race requiring top end speed? No matter the nuances of the racecourse, adjust your training to accommodate the course specifics. You’ll also want to spend as much time as possible riding your mountain bike off-road. While this may seem like a no-brainer, it’s a detail that’s often times overlooked. Time spent on your bike will get you acquainted with the way the bike handles and allow you to dial in the fit before race day. 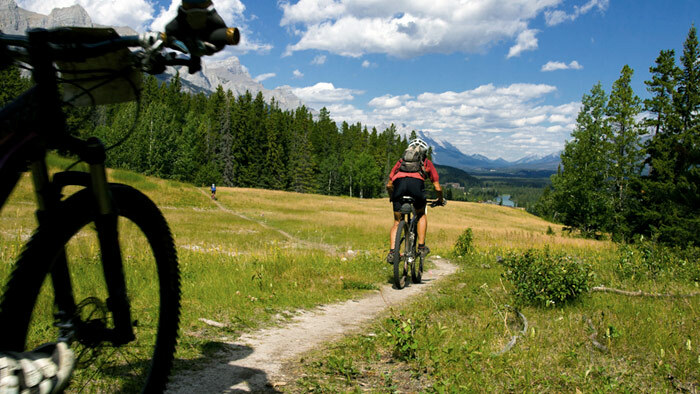 Mountain bike races are notorious for big climbs and can include a lot of elevation gain. While this is one of the things that make these races so interesting, it also requires special training. Most likely, you’ll need to be prepared for a combination of short and steep climbs as well as long sustained climbs throughout the race. To prepare, I prescribe my athletes a mix of climbing workouts leading up to the race. Workouts like 10 x 30 second hill repeats and 5 x 5 minute repeats prepare your body for the short and intense bursts of energy needed to tackle the terrain. I also encourage adding long sustained climbs into your regularly scheduled long rides. This will help increase your overall endurance and leg strength. Cross country races, while requiring agility and endurance, are definitely about speed. Because they’re shorter in both mileage and duration than other endurance events, the need to maintain a higher overall speed is necessary to be competitive. Often times a race will be decided at the beginning of the race, or the “hole shot”. Your training on the road has more than likely given you a good base to transition into some mountain bike specific workouts. Practice max effort sprints to simulate the start of a race with a workout like 45 seconds at maximum effort with 2 minutes recovery. By working on your top end speed you’ll be able to produce maximum power at critical times throughout the race. Push ups: 3 x 15 sets with 1 minute rest in between. Pull ups: 3 x 10 sets with 1 minute rest in between. Curls: 3 x 10 sets with 50 percent max weight. 1 minute rest between sets. Planks: 3 x 1 minute with 2 minute rest in between. Crunches: 3 x 20 sets with 1 minute rest in between. I like to perform these exercises in sequence. To do this, perform one of each exercise back to back, this will complete one set. Take a three minute rest between each set before moving on to the next. No matter if you’re a seasoned road racer, multi-sport athlete, or just looking to mix things up, mountain bike racing provides the perfect compliment to your training and racing calendar. The skills that you develop during training will produce gains in both your fitness and racing abilities, and by implementing a few mountain bike specific training principles you’ll be able to use riding off-road to develop valuable skills both on and off the bike.